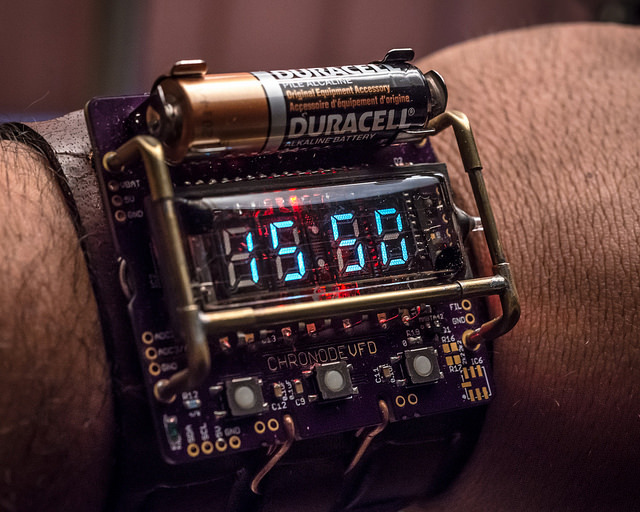 ChronodeVFD, a Watch by @Johngineer #WearableWednesday « Adafruit Industries – Makers, hackers, artists, designers and engineers! Lovely VFD wristwatch by John De Cristofaro! The ChronodeVFD is a personal project I’ve been working on for a couple of months. It’s a wristwatch built around the IVL2-7/5 VFD display tube. I originally purchased a few of these tubes to build a standard desk clock, but after playing around with them, I realized I could probably build a wristwatch too. The tube has a number of features which make it more suited than most Soviet-surplus VFDs for this purpose. nominal 60mA filament current @ 2.4V, but still works with ~35mA @ 1.2V. It’s flat, as opposed to the round tubes like the IV-18, which would be much clunkier in a watch design. One other feature that I like about this device is that unlike nearly every other VFD tube, the IVL2-7/5 has no opaque or diffuse backing behind the digits. It’s completely transparent front to back, which means that if you put it on top of a circuit board, you can (with a bit of backlighting) see the PCB below. What a great design! Thanks for sharing. A nice varient would be to remove the battery from the board and have a number of AA or AAA cells in parallel like a bandolier on the wrist strap.